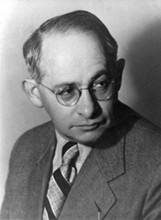 Uriel Birnbaum (1894-1956) was the youngest son of Nathan Birnbaum and Rosa Korngut. He was born in Vienna, but moved with his family to Berlin in 1911, where he began to draw, paint, illustrate books and write poetry. Along with the other members of his family, he embraced Orthodoxy during that period, and his art increasingly dealt with biblical, mystical and religious themes. He was severely wounded in the First World War. 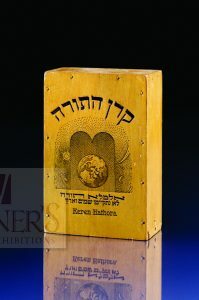 During the interwar period he served as the foremost artist, graphic designer and illustrator for Agudah projects and publications, including those of Bais Yaakov. Along with the beautiful logo of the Agudah educational foundation Keren Hatorah (pictured here), he designed the cornerstone of the Kraków Teachers’ Seminary Building and a document buried beneath it (pictured in the Bais Yaakov Journal). He and his family fled to the Netherlands with the rise of Nazism, and survived by being hidden by Christian friends. He remained in the Netherlands after the war, and died there.